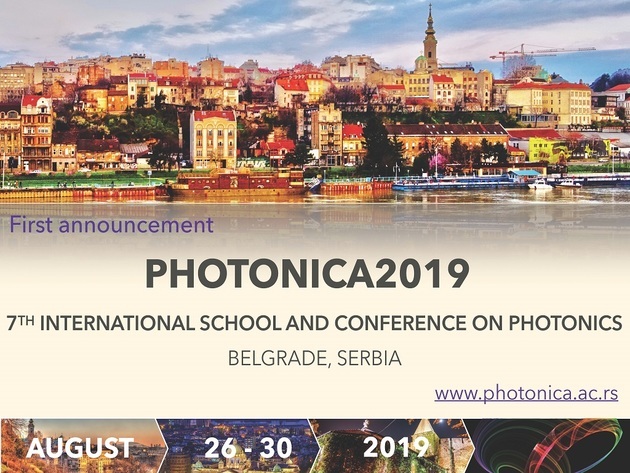 You are cordially invited to participate at the VII International School and Conference on Photonics - PHOTONICA2019 that will take place in Belgrade, Serbia (August 26 - August 30, 2019). PHOTONICA2019 will include five days of tutorial, keynote and invited lectures, progress reports, contributed talks and poster presentations. It is conceived as a school for educating young scientists and the conference facilitating the exchange of new ideas and knowledge in cutting-edge research in Europe and beyond. It brings together not only the scientists from academic and government research institutions, but also the partners from high-tech industry. This concept proved to be very successful in the last five meetings, with participation of more than 200 eminent scientists, young researchers, and companies representatives from the field of photonics.